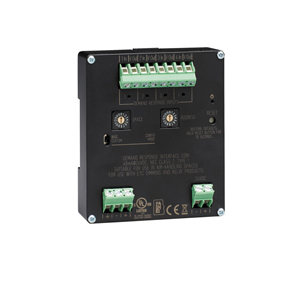 The Elaho Contact Interfaces are available in 4-input or 4-output versions that provide simple and seamless integration with other control systems. The Elaho Contact Input Interface (ECII) accepts wet or dry contacts and uses the closure to execute lighting actions in your Elaho system. The Elaho Contact Output Interface (ECOI) provides triggers to control external devices. Additionally, the output interface can send Elaho system control status, enhancing communications with building management systems. The Elaho Contact Interfaces bring high-performance integration and abilities to a budget-friendly system. 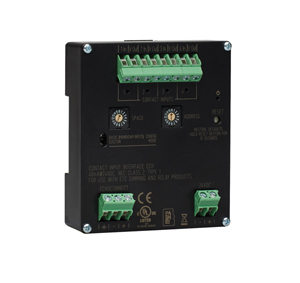 Wet and dry contacts allow the Elaho Contact Input Interface to accept inputs from simple or advanced systems and turn them into actions. Anything from a toggle switch to a command from an enterprise-wide AV system can trigger the Contact Input Interface. Programming using the ElahoAccess mobile app allows the trigger to be configured to suit the needs of any system. For example, a partition sensor can sense whether an air wall is open or closed and trigger your Elaho control system to combine spaces. The Elaho Contact Output Interface offers powerful expanded capabilities. The interface can trigger external actions like shade control or powering on a projector. It can also be used to communicate the state of the system to third-party systems and software like an AV- or building-management system.